When football season begins, emergency room visits for sports injuries increase. That's because about 3.5 million kids and adolescents younger than 14 are injured playing sports every year. Also, according to the University of Rochester Medical Center, over 775,000 kids in the same age group visit the emergency room for a sports injury. To avoid sports injuries, the American Academy of Pediatrics recommends taking at least one day per week off from the sport, wearing proper safety gear, regular stretching, taking breaks and drinking plenty of water. But sometimes, despite the best efforts, football injuries are bound to happen. The following are five common football injuries. The anterior cruciate ligament (ACL) is the ligament in the knee at the joint of the thigh and shin bones. The most common ACL injury is partial or complete tearing. According to MedlinePlus, ACL injuries can happen when you are hit on the side of your knee — common during football tackles. Overextending the knee or quickly pivoting while running can also tear the ACL. But Damion Martins, MD, director of Orthopedics and Sports Medicine, Corporate Health and the Executive Health Program for Atlantic Health System, says most ACL tears come from noncontact injuries. "The patient/athlete will usually complain of a 'pop' in the knee and develop swelling almost immediately," he told dailyRx News. "The diagnosis is usually suspected during initial intake and physical exam, but an MRI is required for confirmation. The Injury requires surgical reconstruction as the patient is at risk for instability and further injury to the knee." If you think you have torn your ACL, seek treatment immediately. You can put ice on the knee and keep your leg raised to help with the swelling, MedlinePlus suggests. Doctors often give patients with ACL injuries crutches and physical therapy, and the ligament sometimes requires surgery. They also prescribe non-steroidal anti-inflammatory drugs (NSAIDs) like ibuprofen (brand names Advil, Motrin and others) to reduce pain. "The rehabilitation after an ACL reconstruction can be anywhere from 6 to 9 months depending if any other structures are involved," Dr. Martins said. Also a ligament in the knee joint, the medial collateral ligament (MCL) is prone to stretching and partial or complete tearing in football or other sports. The MCL stabilizes the shin bone. "MCL injuries often occur with direct forces applied to the outside of the knee, pushing it inward and sideways," Dr. Martins said. "This can result in swelling, pain and instability, which may necessitate further diagnostic testing such as an X-ray and MRI to evaluate for the presence and degree of injury, as well as involvement of other structures such as the ACL or meniscus." MedlinePlus reports that the MCL is often injured along with the ACL. When you have an MCL injury, your knee will likely swell and have a reduced range of motion, along with pain or sensitivity. Like ACL injuries, MCL injuries require medical care. For both ACL and MCL injuries, doctors will determine the extent of the damage and what treatment in necessary. Doctors often tell patients with MCL injuries to put ice on the knee and keep the knee raised. NSAIDs are a common medicine to reduce pain. Another common football injury involves another part of the knee — the meniscus. The meniscus is a wedge-shaped piece of cartilage in the knee that absorbs shock from impacts common on the football field. Acute twisting — which often happens in the quick pivots needed to dodge opponents in football — of the knee can injure the meniscus. "Diagnosing a meniscus injury requires a history of a mechanism that stresses these structures such as sudden pivoting, squatting, or changes in position, coupled with symptoms of injury such as pain, swelling, instability, and catching or locking of the joint," Dr. Martins said. At the time of injury, you may hear a popping sound and have intense pain, followed by swelling and stiffness in the knee. As with any sports injury, see a doctor immediately. Your doctor will likely use the RICE formula for initial treatment: rest, ice, compression and elevation. For later treatment, you will likely have to use crutches and do light exercises to strengthen the knee muscles. In severe cases, meniscus tears will require surgery. Doctors usually prescribe NSAIDs or other painkillers to combat the pain. With all the tackling and collisions, it's no surprise that concussions are one of the most common injuries in football. Bumps or blows to the head are the most common causes, but despite common belief, concussions are not bruises on the brain. A concussion, according to the Centers for Disease Control and Prevention, is a disruption in brain function. 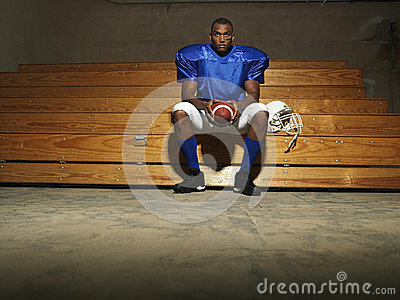 Common symptoms of concussions are severe headache, nausea, dizziness, feeling foggy or dazed and having memory trouble. If you have any of these symptoms, seek immediate medical care. "While an athlete may be symptom free, neurocognitive deficits may persist," Dr. Martins said. "Such deficits increase the athlete risk of injury, and as a result worse outcomes." Concussions and similar head injuries can be very serious. With some head injuries, a blood clot can form on the brain, which can be fatal. Repeated concussions can even cause permanent brain damage. Brain injury symptoms that could indicate a life-threatening condition include one pupil being bigger than the other, slurred speech and a loss of consciousness (no matter how brief). Athletes who have concussions must not play sports until they have received permission from a doctor, warns HealthyChildren.org. Barring serious complications that require hospitalization, doctors usually prescribe rest and avoiding activities that require concentration, including schoolwork and video games. Doctors will often prescribe painkillers like acetaminophen (brand name Tylenol) to treat headaches and other pain-related symptoms of concussions. Contusions are simply damaged areas of tissue with broken blood vessels, which cause bruising. While they may not seem serious at first, contusions should always be taken seriously. Untreated contusions can lead to a serious condition called myositis ossificans, where a bony growth forms on the injured tissue. Many athletes will receive contusions and have no symptoms, but just because they can keep playing doesn't mean they should. After the game is over, the injured athlete will often have pain, stiffness or swelling on the bruised area. A common contusion athletes get when playing football is a quadriceps contusion, or thigh bruising. "Such injury will cause break of the blood vessels at the area and hence the discoloration of the skin at the area of the trauma," Dr. Martins said. Immediately put ice on the bruised area after a contusion. Do not put heat or pressure on the bruise. For serious contusions, seek medical care. For quadriceps contusions, doctors will often recommend crutches, at least three days of rest and stretching, reports the University of Wisconsin Health website.